I know the first official day of summer isn’t until sometime in June, but isn’t Memorial Day weekend really the unofficial start to summer? This year I’m celebrating the kick off to summer by revisiting what was special about the last one. Really it was all about the simple pleasures. And some of them were really, really simple. 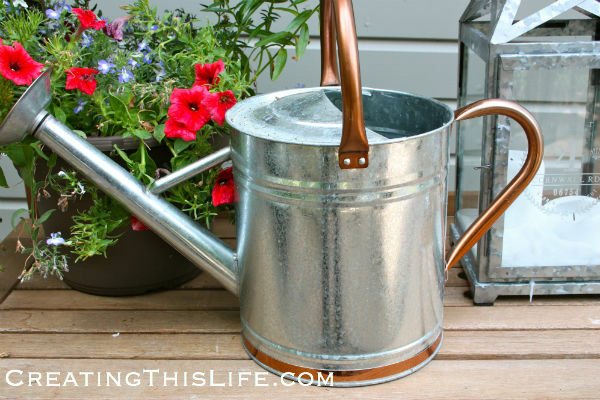 Like a galvanized watering can from the hardware store (one of my favorite places to shop – the smaller and more local the better). And thrifted blue bandana napkins. It’s kind of crazy how happy those kinds of things can make me. Here’s what makes my husband, Tom, happy. 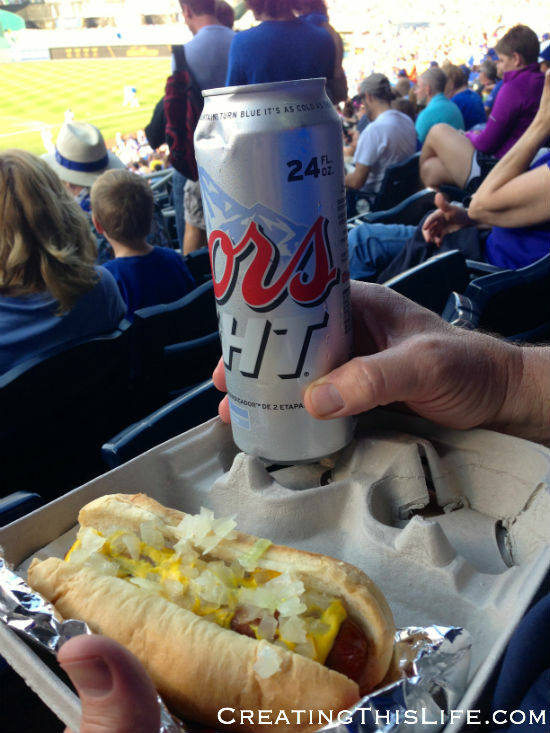 A hotdog and beer at a baseball game. This was a Kansas City Royals game, but really any baseball game will do for him. 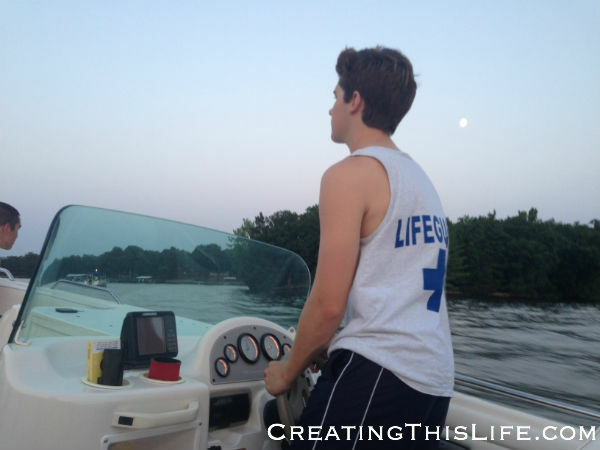 Tom is never more relaxed than when he is with the Lake of the Ozarks with family or friends. He and my daughter, Lindsey, just left for the lake as a matter of fact. And the last two summers we’ve taken my son, Grant, and his buddies to the lake to celebrate Grant’s June birthday. This is a picture of Grant from that weekend last summer. Lindsey and I got to go on a mother-daughter trip to New York last August (you can read about why here). 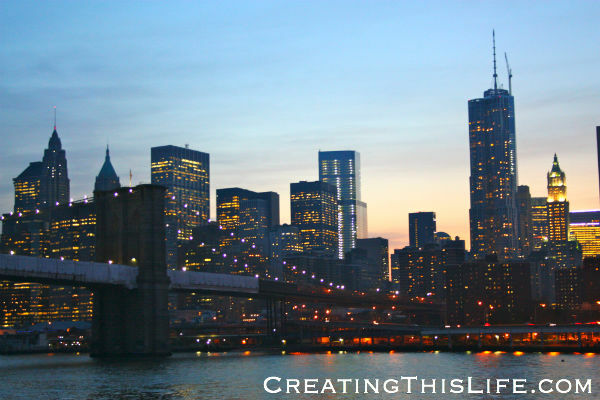 I realize that a trip to New York City isn’t exactly simple, but we decided to do some relatively simple things while we were there. 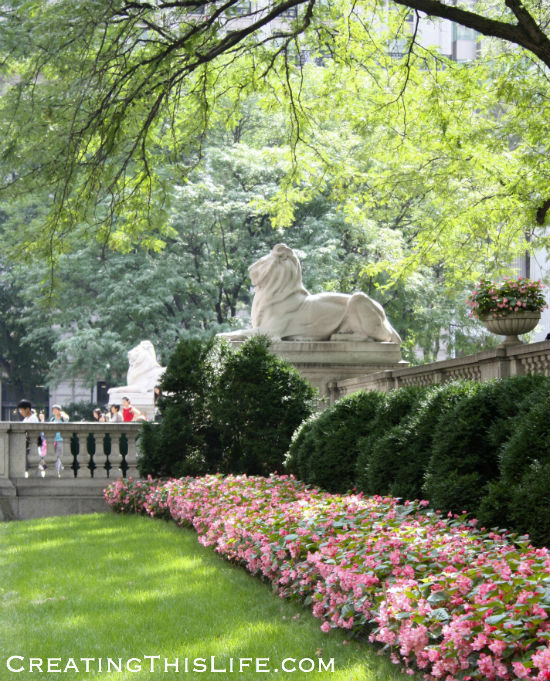 Like visit the main branch of the New York Public library. That’s been something I’ve always wanted to do. I love those lions! We also took a dinner cruise around Manhattan. The sights from that boat were amazing and it’s one of the most relaxing things I’ve ever done on a vacation. 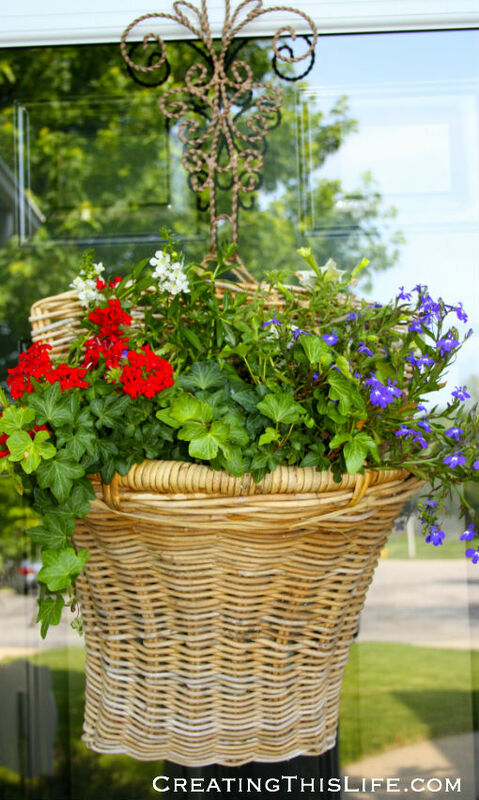 Here’s an experiment that I tried last summer: real flowers in a basket on our front door. They actually did okay for a while, until the extreme heat of summer and my watering laziness got the best of them. But I think I’ll try again this summer. And I love, love, LOVE red, white and blue bunting. I used to think I didn’t have a good place to put it because I don’t have a white picket fence or a porch railing out front. 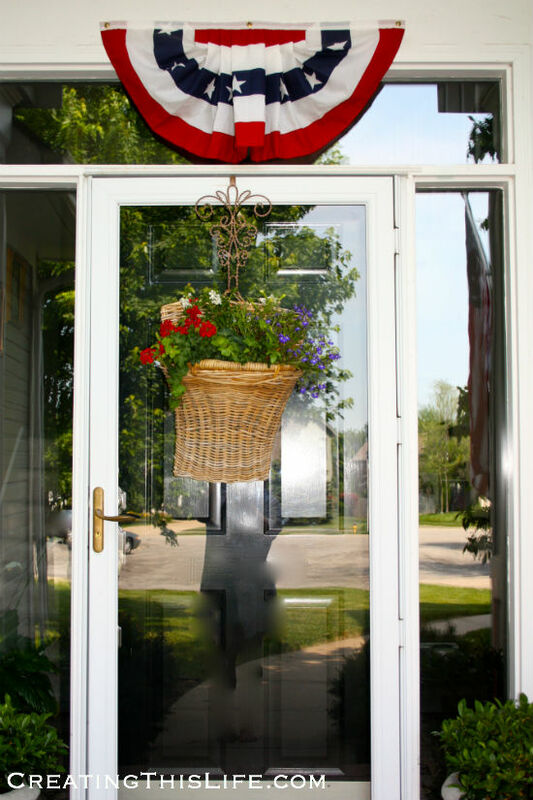 But one year I tried it here above our front door and now I generally keep it up from Memorial Day to Labor Day. Speaking of the red, white and blue, thank you to all the men and women in uniform – and those that came before them – for making all these simple summer pleasures possible for the rest of us. You have our sincere gratitude. I’ll leave you with this quote I ran across a few years back that seems appropriate for Memorial Day. And I’d love to know: When does summer begin for you? What are some of your favorite summer pleasures? Brenda from the blog Cozy Little House sent me over. I love your blog. The photos are very beautiful. A wonderful post. I love to enjoy the outdoors during the summer. In any way I can! I am visiting via Cozy Little House. 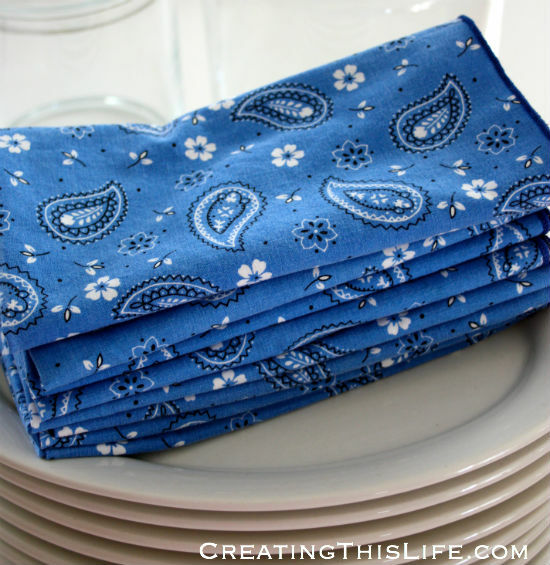 I absolutely love those thrifted bandana napkins. I am hosting a party next weekend and those are exactly what I am looking for to use. Hi! I came over from Cozy Little House. Love your blog! Summer begins on Memorial Day weekend for me. I love when all the family gathers for cookouts. Love having all you Cozy Little House visitors on the blog. Thanks for the nice comments and I hope you’ll all be back!